Nathan's Real Estate Notions: Tax Credit EXTENDED! The Market is Fierce Out There! On Monday there were 2,790 properties on the market. This reduction in supply is challenging many of the buyers I'm working with today. One client is purchasing a single family home at $400,000 and I have written 10 offers in the past 2 months for them, and there was an average of 6 other offers on each property we wrote an offer on. Low prices, the $8,000 tax credit, and low interest rates are contributing to this surge in activity. Since the majority of the foreclosures are being withheld from the market, the predominant type of property available to purchase is a short sale. I came across a rock solid article on short sales put together by a successful agent in Southern California titled Top 10 Home Buying Tips For Short Sales - Guide to Understanding Short Sale Foreclosure Real Estate. Anyone going through or considering a short sale should read this article. TAX CREDIT EXTENDED: April 30, 2010 is the new deadline for the $8,000 First Time Home Buyer (and now repeat homebuyer) Tax Credit. Click here for a video regarding how the credit works, and you can visit the website http://www.federalhousingtaxcredit.com/ to read the frequently asked questions about the credit. 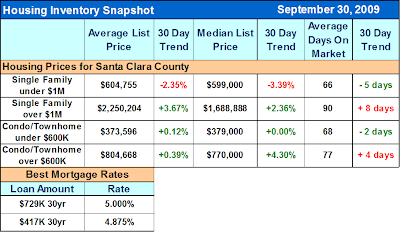 The chart below shows that the cities east of highway 880 only have 30 days of inventory where 6 months is considered a "balanced" market. Regardless of the forces, home prices will rise as it is a "supply vs. demand" economy. For Comparison: The West side of Highway 880 is slowly picking up steam and following suit. The holiday season will not stop people from buying great deals in the area. The extension of the tax credit will continue to spur activity as well as low interest rates. Prices all across the bay area will continue to rise. The table represents aggregated values based on MLS data for the specified date. Enjoy the rest of your week and as always I welcome referrals from friends, co-workers or family members looking to buy a piece of property. I am also happy to provide sound unbiased advice at any time. You can rely on my integrity and follow-through. "Before God we are all equally wise – and equally foolish." This blog follows the real estate markets in the Bay Area and the surrounding counties. For more information please visit my website http://www.nathanproperties.com/ where you can get free advice on selling your home, information on listings available to purchase, loan calculators, school information and various tax savings ideas.